The light in the forest casts a holy spell in George Inness Jr.’s painting. What is it about Florida that brings out the crazy in people? It can’t be simply the beaches and the palm trees, the warmth and the flip-flop-friendly lifestyle. All those things are abundantly present in many other places in the world where the tendency to Nutitude doesn’t seem so lushly present as it does in some parts of Florida. I’m referring mainly to the touristy regions, of course. Never having lived in the state, I can’t testify to the mindset of the populace as a whole, but during the numerous visits I’ve made to relatives in different parts of the sunshine state, I’ve been impressed by the free-wheeling attitude that seems to thrive in the tourist zones. Of course, since the days of the earliest explorers Florida has attracted people with an imaginative streak. Ponce de Leon and his search for the Fountain of Youth springs to mind. Get rich quick types have been trying to squeeze the sweetness out of Florida since the first orange groves were planted. And Disney demonstrated that if you build a fake castle in the middle of the sun belt, you can get people to believe their dreams will come true there. Well, although I was raised on the Mickey Mouse Club and the world according to Walt, these days Disney doesn’t do it for me. On a recent visit to the Tampa area I had modest expectations of some quiet exploration and perhaps a discovery or two. But I never imagined I would encounter world class artwork hidden away in the tiny town of Tarpon Springs, a place best known for its once-thriving sponge business. Nowadays I’d bet the merchants along the sponge docks sell more Greek pastries than sponges. The sponge history still draws people there. Come for the sponges, stay for the galaktoboureko. 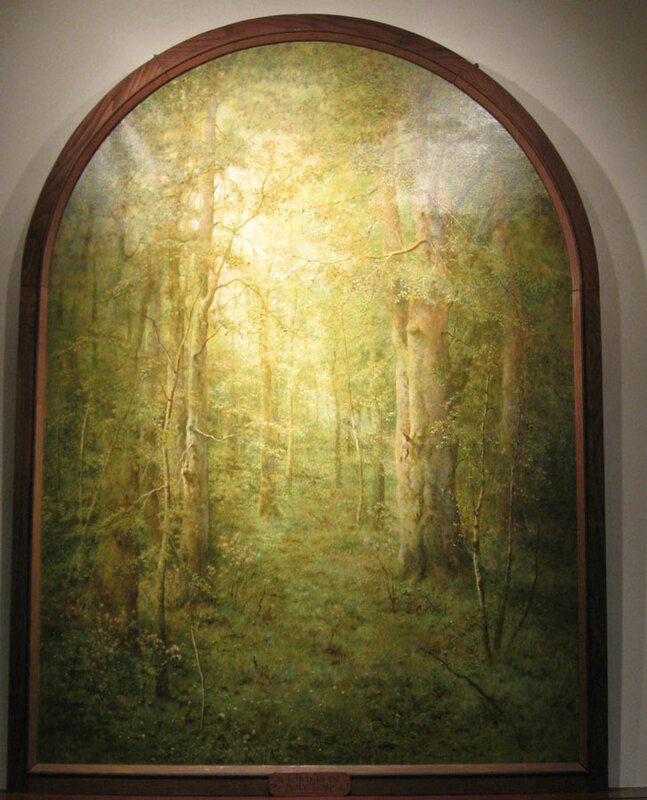 However, when we wandered off the beaten path we came upon the cozy Unitarian Universalist Church and happened onto a tour of their prize collection of “mystically tinged religious works” painted by George Inness Jr. I had never heard of Inness Jr. before, but soon learned that he was the son of famous American landscape artist George Inness. George Jr. also painted landscapes, but his are imbued with a spiritual subtext that sets them apart. I was mesmerized. In particular I was enthralled by the last work he painted, completed three days before he died. It depicts an endless forest bathed in glowing light. It spoke to me. That, of course, is what all art attempts to do—to communicate an idea, a feeling, a sense of place or person. The painting beckons the viewer to walk in the woods, not to get anywhere necessarily, but to enjoy the trip. I tried to imagine what Florida must have been like in 1926 when Inness Jr. was creating these paintings. Back then there were no gleaming hotels in Miami, no plastic castles in Orlando, no captive orcas giving two shows a day. And there wouldn’t have been the miles and miles of strip malls and retirement communities. It was a quieter, wilder Florida. That quiet wild part of Florida is still there. But it’s being pushed out, paved over and polluted by the crunch of careless development. And that’s a shame. In the peaceful pockets of old Florida you can get a sense of the wonder and mystery of the place. 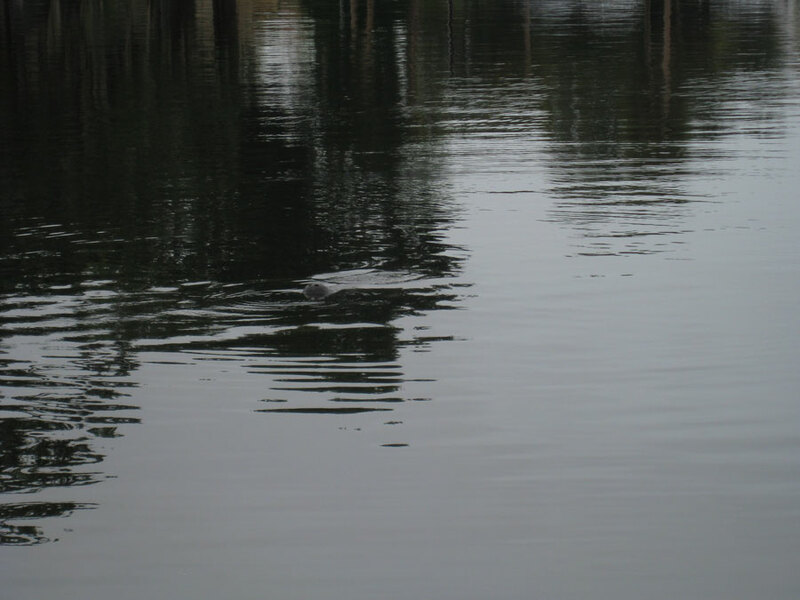 Along the back streets of Tarpon Springs we discovered a lovely still bayou, where the only sound was the occasional puffing of a manatee, sticking its nose above the water’s surface to grab a breath. Down by still waters, the manatee is coy. In recent years the gentle manatees have become poster creatures for all that is precious and endangered in the Florida wilderness. As we were waiting to catch our flight home the newspapers were leading with the story of the invasion of green anacondas into the Everglades. Previously it was thought that Burmese pythons, which have been breeding at an alarming rate and decimating the wildlife in Florida’s wilderness areas, were the problem. Now it appears that green anacondas, which get bigger and are more robust than the pythons, present a much greater threat. So, where does this leave Florida? Hoping for a miracle? Looking for a way to cash in and turn the problem into a revenue stream? Anything is possible. Except for the Fountain of Youth thing. That’s total hooey. 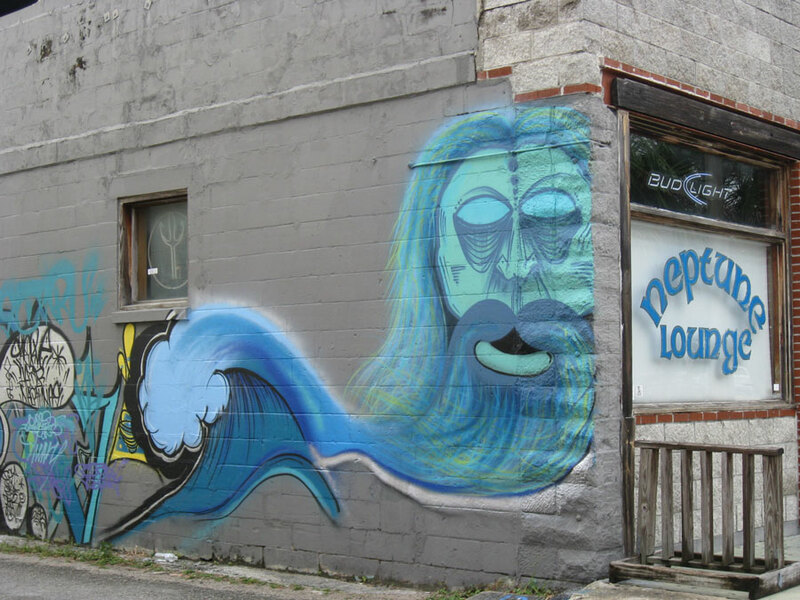 You can sip a brew at the Neptune Lounge while trying to figure out where to draw the line between old gods and new.